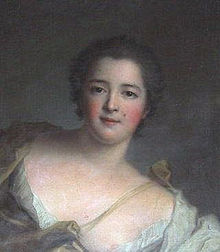 This is Louise-Julie de Mailly Nesle, known as Mademoiselle de Mailly before her marriage and the Comtesse de Mailly after. I love this portrait of her - she looks very spunky and wry - and it's very out of keeping with other contemporary portraits. The fashion in the early part of the 18th century, at least at Versailles, was to be painted within a Greek or Roman allegory. Here Louise is wearing some kind of fancy dress, I think, with that hat and those sleeves - definitely a 16th century / Elizabethan flair. According to Sotheby's, this portrait is by Alexis Grimou, and is "said to be of Louise-Julie de Mailly Nesle". Grimou died in 1733, so if he did paint her, it would have been long before she was publicly acknowledged as Louis' mistress. The portrait sold in 2011 in New York for $28,000, after being estimated to go for between $6-8,000. I wonder who bought it? Louise was supposed to have had 32 portraits painted during her lifetime! Unfortunately very few survive, at least on the Internet. According to one source: "Two pastel portraits of the comtesse have survived, one by Maurice Quentin de La Tour (1704 – 1788) and Jean Marc Nattier (1685 – 1766)." 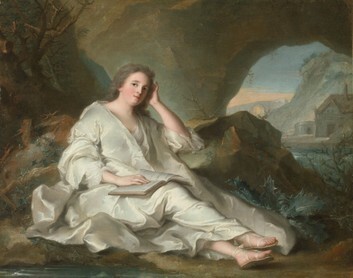 If you look at this pastel study of an "unknown lady" by Maurice Quentin de la Tour, right, there is a definite resemblance to the finished painting above. 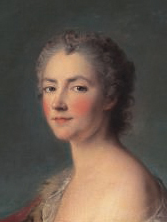 I couldn't find any other evidence on the internet for a portrait of Louise by Quentin de la Tour. This portrait on the left by Nattier **might** be Louise, posing as Magdalene the penitent, which is rather ironic given what happened to her later. The painting was sold last year by Christie's during an old masters' sale. It was estimated to go for between $60-80,000, but sold for only $11,000! Finally, here is another portrait supposedly of Louise. She's dressed as Diana the Huntress, but she doesn't look very happy, or very pretty, but there is something about her gaze that is compelling. Louise was quite a challenge to write. In The Sisters of Versailles, she's portrayed as passive and accepting of ill-fortune, and lacking the ambition and manipulative qualities of at least two of her other sisters. Still, the fact remains that she and Louis were lovers for at least 6-8 years (the exact date of their first encounter differs in virtually every account), including many years from the time they were "outed". She couldn't have been as bland and dull as her rather more cruel sisters made her out to be, and she certainly survived, and even thrived, in the snake pit that was Versailles.